The Coastal Response Research Center is focused on developing new approaches to spill response and restoration in marine and estuarine environments through research and synthesis of information. The Coastal Response Research Center will not be announcing its 2010 Annual Request for Proposals (RFP) this May. Download more detailed documents with background and technical information. Officials with Gaylord Opryland Hotel plan to hold talks with the U.S. Army Corps of Engineers on Wednesday to press for answers about dam releases that swelled the Cumberland River during the May floods, as well as who will pay to increase the size of the levee that protects the Opryland property. “We have big-time questions for the Army Corps and government agencies that regulate the water,” Gaylord CEO Colin Reed told investors and analysts this morning. Had hotel officials been given accurate information earlier on May 2, they could have saved more vehicles and memorabilia, especially at the Grand Ole Opry, he said. The Corps’ Nashville commander, Lt. Col. Anthony Mitchell, will listen to Gaylord’s concerns and talk about the Corps’ role during the flood, said Bill Peoples, spokesman for the Corps’ Nashville district. It would take an act of Congress for federal dollars to be spent. Contact Bonna Johnson at 615-726-5990 or bjohnson@tennessean.com. NASHVILLE, Tenn. — Three weeks after the floods, a Channel 4 I-Team investigation reveals how data used to warn the public were not only outdated, but in some cases, wrong. The investigation uncovered problems in the information that the National Weather Service was given to predict the the crest of the Cumberland River. On May 2, 2010, the National Weather Service was in a race against time. Homes and businesses along the Cumberland were in danger, and forecasters needed all the information they could get. And they needed information from the Army Corps of Engineers about how much water was being released from the Old Hickory Dam. “We’re taking that latest information from the Corps, factoring it into our models,” said National Weather Service Meteorologist Larry Vannozzi at a news conference last week. The National Weather Service had constant access to rain and river gauges. But the I-Team discovered it didn’t even have hourly updates on the dam even as the information on water releases kept changing. The I-Team learned the Corps lost e-mail services on May 2 for 11 hours, between 9 a.m. and 8 p.m. The Corps and the National Weather Service had to rely on phone calls. Records show only four phone calls were exchanged that day between the two federal agencies, along with one e-mail early Sunday morning. But on that day, the amount of water released from the dam changed 22 times. The Corps continually let more water out, trying to keep the water from over-topping the dam. An I-Team analysis shows at 1:30 p.m. on May 2, the National Weather Service called the Corps to get the latest data on how much water was being released in order to make its next crest prediction. But after that call ended, the Corps increased the amount of water being released nine additional times, including opening the gates to their maximum level. In the meantime, the National Weather Service kept making predictions, unaware of the increased water releases, until it spoke with the Corps again by phone at 7 that night, 5 1/2 hours after the last call. “If we had information that was, you know, several hours old, or something, that’s the information we were working off. We work off the latest information provided by the Army Corps of Engineers,” said National Weather Service Hydrologist Jim Nole at last week’s joint news conference between the Corps and the National Weather Service. A National Weather Service spokeswoman told the I-Team that during the 7 p.m. call, the Corps told the National Weather Service that the dam would be releasing water at 150,000 cubic feet per second. But the Corps’ own records show at that time, it was actually releasing much more water: 211,730 cubic feet per second. The National Weather Service spokeswoman told the I-Team that it gave the best prediction it could, given the information it was given at the time. Despite the lack of timely information and the incorrect data, Corps officials praised the sharing of information at last week’s news conference. “Across the board, I think the agencies worked well together, in terms of relaying communications and being as responsible as we possibly could,” said Lt. Col. Anthony Mitchell. May 17, 2010: Lawmaker: Was Dam Flooding Man-Made Disaster? * Video: Lawmaker: Was Dam Flooding Man-Made Disaster? It would be “completely unacceptable” for the Army Corps of Engineers to fail to do a detailed study of the May floods in Nashville and Tennessee, U.S. Rep. Jim Cooper says. Cooper, D-Nashville, said he has been told that the Corps’ Washington leadership has decided not to do a report on the flood because of budget considerations. “I am stunned the Corps doesn’t feel it is necessary to investigate their response to a multi-billion-dollar disaster,” he said in a statement issued Friday. Bill Peoples, spokesman for the Nashville District Corps office, said a lessons-learned study will be finished in 30-60 days, and that some work has been carried out on a larger report, such as the one that Cooper is referring to. High-water marks have been recorded, which is the first step in the more extensive study, Peoples said. “We’ve requested funding for a post-flood report,” he said. The request was made to the Corps headquarters in Washington, D.C.
That office, which The Tennessean could not reach Friday night, determines what funding to ask Congress to appropriate. Cooper said the report would dig deeper into details on key data that could provide information helpful to protect local communities in the future. He would back funding for such a study, the congressman said. “We have to have the real facts about what happened,” he said Friday night. U.S. Sen. Lamar Alexander, R-Tenn., also said last night that he would back a detailed report. “If further funding is required for a more technical engineering report, I will work to help secure that funding,” he said in an e-mailed statement. Alexander announced last month that he would hold a Senate hearing at a later date to assess the Corps’ actions during the flood. Storms dumped more than 18 inches of rain in parts of Middle Tennessee over the first two days in May, causing widespread damage and 24 deaths statewide. Ten of those were in Nashville where one man remains missing. Anne Paine can be contacted at 615-259-8071 or apaine@tennessean.com. State regulators have returned to normal water quality testing of Tennessee’s lakes and rivers after heightened monitoring since the flood. Most bodies of water have returned to pre-flood conditions. May’s flooding caused 200 sewage pumping stations to malfunction, along with 70 waste water treatment plants. Many were spewing raw sewage into waterways such as the Cumberland River. There were also thousands of so-called “orphaned containers” floating around – including large propane tanks, oil drums and thousand of smaller gas cans. Tennessee Department of Environment and Conservation second-in-command Paul Sloan says the same water that caused all the damage also helped water down the contaminates. TDEC is reporting normal conditions in all areas except downstream on the Cumberland River from Clarksville. There’s a sewage treatment plant that is still not fully functional and won’t be for several more weeks. Despite the thousands of fuel containers floating in the floodwater, TDEC did not find much in the way of organic compounds in the Cumberland River. After the initial testing for petroleum products turned up no problems, TDEC discontinued the sampling. The Army Corps of Engineers will hold a meeting Tuesday to collect recommendations, suggestions and comments to help define the scope of studies that will be conducted for the Missouri River Authorized Purposes Study. The evening will include an open house from 5 to 7 p.m., followed by an hour for public comments at the Mid-America Center, 1 Arena Way. Participants may attend at their convenience. “We encourage the people planning to participate in these scoping meetings to come prepared to talk about what’s important to them and the problems and opportunities that should be addressed by the study,” said Mark Harberg, study co-manager. Congress directed the Corps to conduct a study of the Missouri River projects within the basin to review the original project purposes based on the 1944 Flood Control Act to determine if changes to these purposes are warranted. The eight purposes are flood control, hydropower, water supply, irrigation, navigation, recreation, water quality and fish and wildlife. Infrastructure operated by both the Corps and Bureau of Reclamation is included in the study. Individuals that require assistance under the Americans with Disabilities Act to participate in these meetings can contact lois@djcase.com at least three days prior to a specific meeting. Those who use a telecommunications service for the deaf may call the Federal Information Relay Service anytime at (800) 877-8339 to relay this same information. Comments will be accepted through Sept. 20. They can be e-mailed to: mraps@usace.army.mil or sent to U.S. Army Corps of Engineers, Missouri River Authorized Purposes Study, Attn: CENWO-PM-AA, 1616 Capitol Ave., Suite 9000, Omaha, NE 68102-4901. For more information about the Missouri River Authorized Purposes Study, visit: http://www.mraps.org. Water is everywhere after Monday’s flash flood that forced Arcadia Lake to close. Army Corps of Engineers is not opening the dam, preferring to keep the water in lake because of flooding downstream. EDMOND — A squirrel jumped on a concrete barrier Wednesday and looked toward a picnic table almost submerged in rising water at Arcadia Lake. Check out the latest hourly water level at Arcadia Lake. The animal looked the other direction before taking off, only to run into more water — this time covering the road. Water is everywhere after Monday’s flash flood that forced officials to close Arcadia Lake. A pavilion was under 3 feet of water, and all the boat ramps were submerged. The lake was up 16½ feet by midafternoon Wednesday. Officials estimate the lake could crest earlier than their original projection of Sunday. Officials estimate about one-third of the 700-acre park is underwater. Leon Mixer, lake supervisor, said the Army Corps of Engineers can’t let the water out of the lake because downstream along the Deep Fork River also is flooded. Once the water downstream subsides, Mixer said, the Corps will begin letting water out of the lake. The downstream water levels are expected to crest Sunday. Water from Arcadia Lake will eventually make its way to Lake Eufaula. Mixer advised that people stay away from the lake. It is unknown how long the lake will be closed. The last time the park flooded was in 2007. The lake was closed for 28 days. Mixer, who has lived in the area all of his life, said the water was only higher one other time in the mid-1990s. Jun 15 The Valley residents are starting their cleanup after Monday’s flood. Jun 14 Eric Harlow talks about his rescue team and who they rescued. Jun 14 Homes at 172nd and Pennsylvania Avenue in The Valley neighborhood were flooded with high waters. Flood-soaked communities across the state are bracing for another wave of stormy weather that could make high water levels climb higher. On Friday, the U.S. Corps of Engineers sent 400,000 sandbags to Ogallal, 50,000 to Norfolk and more to areas along the Missouri River. Emergency management officials said people living along the Elkhorn River need to be especially watchful. “We could be seeing another significant risk over flood stage on the Elkhorn River,” said Nebraska Emergency Management Agency Assistant Director Al Berndt. The warning comes as water was receding in Norfolk. “I’m proud to say Norfolk is again open for business,” said Nebraska state Sen. Mike Flood. He said his community is working on recovery and bracing for more water. State officials said they’re also concerned about flooding along the Platte River near Big Springs and Ogallala. They said storms are forecast for that area and additional water is being released from Wyoming dams. Warnings on development risks ignored in Cobb city at juncture of 5 creeks. When the floodwaters finally receded in Austell, city leaders, the federal government and a giant rail yard in the crook of two creeks all took the heat from angry victims. The small city’s mayor had answers. The words will sound familiar to Austell residents who squeezed into civic meetings last fall, seeking an explanation for September’s epic floods. But they were spoken more than four years ago. Austell’s creeks have made a mockery of flood prevention policy for decades. One of September’s hardest-hit cities, Austell sits at the juncture of five creeks and in the bull’s-eye of a suburban building boom. Rainwater that once soaked into fields or forests now washes off parking lots and roofs, then heads — it seems — to Austell. An Atlanta Journal-Constitution analysis published Feb. 21 found a dramatic link between the increase in man-made, nonabsorbent, “impervious” surfaces in the metro region and the size and speed of floods. Regional shortcomings in storm water planning aggravated the problem, the AJC found. Those flaws included splintered, jurisdiction-by-jurisdiction planning that ignored downstream impact and federal flood maps that didn’t keep up with that development. Austell, with 6,300 residents, plans for flood prevention as well as, or better than, most communities in the region. But it suffers from the region’s shortcomings, too. Combined with its natural vulnerability to floods, those flaws have made Austell the New Orleans of the region, said attorney Don Stack, who has represented hundreds of homeowners with development-related flooding problems. The region’s piecemeal flood planning, for instance, gives Austell no say in upstream development. The already flood-prone city sits on the low end of a suburban drainage basin where the kind of hard surfaces that make creeks rise higher and faster increased by more than 50 percent over a decade, the AJC found. Inside Austell’s borders, the city also allowed, or was forced to accept, development that appeared to defy common sense. Private property rights and litigation, or the threat of it, helped put development in areas that conventional wisdom said would flood. The 8-year-old, 450-acre Norfolk Southern Intermodal rail yard is one example, with its acres of pavement nestled in the flood-friendly juncture of the Powder Springs and Sweetwater creeks. Another is Mulberry Creek, a 2003 subdivision downstream from the intermodal. Austell’s tendency to flood has been recognized since at least 1964, the first year the city asked the U.S. Army Corps of Engineers for help. Between 1964 and 1995, the corps studied Austell four times. Its conclusion: The city is built in a bad place. Austell has been described as the catch basin for Paulding, Cobb and Cherokee counties. The biggest of its five creeks, the Sweetwater, flows in from Paulding, one of the nation’s fastest-growing counties. The other four creeks bunch into the Sweetwater from the north just as it flattens out and winds through Austell. In a big rain, water can get into Austell but it can’t get out. The corps’ studies offered four potential solutions, but deemed none worth the cost. Even the cheapest — dredging and cleaning out the creek — failed the dollar-to-dollar cost-benefit test then needed to get federal help, said corps spokesman Patrick Robbins. The final corps studies followed two back-to-back floods in 1990, both of a size hydrology experts consider rare. A 100-year flood is so big that hydrologists give it one chance in 100 of happening any given year. It’s the benchmark for national flood policy. The Sweetwater almost reached the 100-year mark in February 1990, then hit it the next month, said Mayor Jerkins, who called in the corps in response. “I have lived here all my life, and in 1990 was the highest I have ever seen the water rise,” he would tell residents 15 years later, after an even bigger flood. That was in 2005, when the Sweetwater rose “3 foot and 2 inches higher than in 1990,” Jerkins said. He called it a 500-year flood, although the U.S. Geological Survey says it didn’t quite hit that. The 500-year flood has a 0.2 percent annual chance. While Jerkins blamed rain, other city officials wondered. Four years later, the Sweetwater outdid itself again. The USGS couldn’t rate September’s flood, except to say it was much bigger than a 500-year event. A lot changed in the Sweetwater’s drainage basin during the years when its floods got worse. Since the last corps study, areas upstream of Austell issued 175,000 new home permits, according to a federal database. Homes and the roads, driveways and shopping centers that serve them mean more rain-repelling surfaces on ground that once soaked up rain. Planners required drainage systems, but only recently began taking cumulative downstream effects into account. In some creek basins, such as Powder Springs Creek upstream of Austell, man-made surface area grew by 50 percent or more in the past decade. Streams through such areas are “flashier” — peaking faster and higher after rains — than in the past, the AJC analysis shows. The analysis found a tipping point: Once hard surfaces cover 30 percent of a creek basin, each addition of pavement has an increasingly bigger impact on streams. Austell sits in the pincers of two problematic creek basins. In addition to the jump in hard surfaces in the Powder Springs Creek area, the Olley Creek basin has passed the 30 percent tipping point. As development continued upstream, Austell grew, too — although modestly. The city issued 1,050 residential building permits between the corps studies in 1995 and 2008, the federal database said. Austell also added developments — like the Norfolk Southern Intermodal in 2001 and Mulberry Creek subdivision in 2003 — in areas residents said would flood. The intermodal is where the railroad transfers cargo containers between trains and trucks. Austell, Powder Springs, Lithia Springs, East Point, Cobb County, the Cobb Chamber of Commerce, the Atlanta Regional Commission, the state Senate and, for a time, the U.S. Environmental Protection Agency all tried to stop it. The railroad prevailed. Its federal lawsuit against Austell brought a landmark decision exempting such facilities from local zoning. The 450-acre intermodal stretches southeast along Powder Springs Creek to its juncture with the Sweetwater. The area had flooded before, as a local environmentalist wrote the corps in 1997. The railroad built four huge ponds and new wetlands to control runoff. The system exceeded local and state standards, didn’t change the 100-year flood plain and let water into creeks more slowly than undeveloped land, company studies said. The state-of-the-art-plus system is typical of Norfolk Southern projects, said spokeswoman Susan Terpay. But Stack, the lawyer, said the intermodal likely changed creek behavior in ways public policy doesn’t grasp. Storm water policy addresses the rate of runoff, but not total volume. The intermodal also meant that “water that used to move in sheets, in a widespread area, ended up being focused into four discharge points. What should have been spreading out was concentrated,” he said. No one knows what the intermodal or building upstream did to the Sweetwater. A comprehensive study hasn’t been done in years. City public works director Randy Bowen said a new one is needed. “We are actively trying to get a restudy of Sweetwater Creek,” he said. The Cobb County Commission agreed last week to do that study. Austell’s situation may be extreme, but it exemplifies problems that face storm water planners across the region. Development has outpaced the tools, such as flood maps, used to measure the impact of lots of rain. Local control means communities can’t affect or even understand what upstream building does to their creeks. And property owners have rights. That’s what led to Austell’s 2002 approval of the Mulberry Creek subdivision, which sits on an old horse farm partially inside Sweetwater Creek’s 100-year flood plain line. Neighbors and city officials warned of flooding. Councilman and subdivision opponent Bo Traylor said water had been as high as a man’s head there: “It was common knowledge that the area floods,” he said last fall. City officials say they OK’d the 25-house subdivision because they believed the property owner could sue and win. “If they met our development standards, then they have a right to develop,” said Community Service Director Jim Graham. Development laws try to balance public safety and private property rights. Austell does that by allowing building in the 100-year flood plain only if lots are raised up out of it. The lowest floor must be 3 feet above the line. It’s a common standard, although not endorsed by everyone, since built-up flood plain moves water elsewhere. Douglas County bans building in the flood plain. The region’s water district encourages other options, too. The standard requires reliable flood plain data, which is in short supply. Even the newest Federal Emergency Management Agency flood risk maps, released in December 2008, are based partly on Sweetwater Creek hydrology studies that are 24 years old. Mulberry Creek flooded in 2005 and again last fall, when 19 of 25 houses were damaged. Both floods far exceeded the official 100-year mark. The Sept. 21 flood was a hydrological train wreck for Austell. According to USGS, 18 inches to 22 inches of rain fell on Paulding, west Cobb and Douglas counties Sept. 18 to Sept. 22. The soaked ground repelled rain into creeks almost like pavement. A Norfolk Southern gauge recorded 9 inches in four days. A monitor just upstream saw 11 inches in 24 hours. Typical Atlanta rainfall is 50 inches in a year. Flooding near the intermodal was dramatic. At an intersection near its tip, water reached a stoplight. Workers at a neighboring recycled paper company, Caraustar Industries, saw water on intermodal tracks rise to an overhead bridge. The water swamped Caraustar from an unusual direction, Chief Financial Officer Ron Domanico said. The Sweetwater skipped a bend and charged across Caraustar’s property instead, pushing over a power pole, hurling 17 tractor trailers into a park and jamming another five under a bridge. The water, it seemed, “was coming from the intermodal,” Domanico said. Data from Norfolk Southern’s monitors, obtained under the state Open Records Act, tell a more confusing story. As the rain fell, the intermodal’s four detention ponds slowed the rain’s path to the creeks as designed. They nevertheless sent lots of water — 2.9 million cubic feet on Saturday and 9.3 million cubic feet on Sunday — into the creek the weekend before the flood. The Sweetwater’s flow past the rail yard on a dry day last fall was about 71 cubic feet per second — or 6.2 million cubic feet a day. But, what the rail yard added to the creek that day is a mystery. Two monitors were underwater and reporting nothing. Two others reported releases of 6 million cubic feet, although Norfolk Southern says it cut power to them that day: The reading may not be complete. By 1 p.m. that day, the creek was so high that it flowed backward into a rail yard retention pond. Last Sunday: Explosive growth, poor planning and neglected infrastructure have helped turn even unremarkable rainstorms into property-wrecking events in metro Atlanta. Last Monday: Homeowners often bear the cost of runoff management. Last Tuesday: While local governments take a tougher stance on controlling runoff, the state and federal government are pushing back. Today: Sitting at the juncture of five creeks, Austell has suffered from the metro region’s flood-planning shortfalls for years. Monday: A closer look at solutions. Some local governments across the country have taken a more aggressive approach to handling storm water. On ajc.com/metro: Catch up on the series and find an in-depth metro map highlighting areas most susceptible to flash flooding. Austell sits at the base of two problematic creek basins and is circled by three other creeks. Man-made “impervious” hard surfaces have increased dramatically in the Powder Springs Creek area and, in the Olley Creek basin, have passed the 30 percent tipping point that makes streams “flashier” — peaking faster and higher after rains, making the areas more susceptible to flash flooding, according to the AJC analysis. Powder Springs Creek basin: Man-made surface area has grown by more than 50 percent in the past decade, including the 450-acre Norfolk Southern Intermodal that sits along Powder Springs Creek to its juncture with Sweetwater. Olley Creek basin: Impervious surface has passed 30 percent. The Mulberry Creek subdivision flooded in 2005 and again last fall, when 19 of 25 houses were damaged. As development continued upstream, Austell grew, too — the city issued 1,050 residential building permits between 1995 and 2008. Austell also added developments — chiefly the Norfolk Southern Intermodal in 2001 and Mulberry Creek subdivision in 2003 — in areas residents warned would flood. September’s flood on Sweetwater Creek was significantly larger than a 500-year flood event — a flood so big that it’s given only a 0.2 percent chance of happening in any year. A 100-year flood has a 1 percent chance of happening in any year. The Cobb County city has experienced at least a 100-year flood several times since 1990. Dredging might help control Sweetwater Creek for a while. But Austell Mayor Joe Jerkins thinks the city needs a long-term fix — a water escape valve. He wants a pipeline built near the point where the Sweetwater makes a final turn toward the south. The pipe could divert water from a flood-prone portion of the creek to a point downstream where the creek is moving faster: “It would take it down to where there’s more fall,” Jerkins said. The pipe would take in water only when the creek got high. New laws passed across the region give cities and counties a legal tool for flood prevention — future flood plain maps. The new maps could supplement often outdated federal maps with more up-to-date information, helping officials plan new development and more accurately assist those in older developments assess flood risks. Austell also wants a new multi-county study of Sweetwater Creek. The U.S. Army Corps of Engineers and the Federal Emergency Management Agency are helping Austell determine whether it needs to change its laws related to flooding . The Atlanta Journal-Constitution took a closer look at Sweetwater Creek in Austell because of the magnitude of the flooding there Sept. 21 and because the area had also flooded four years earlier. To assess the state of storm water policy, the AJC interviewed more than 60 homeowners, local officials, engineers, environmental officials and policy experts and reviewed state storm water permits and annual reports filed by 15 metro area cities and counties. The AJC analyzed the effect of development on metro Atlanta streams using monitoring data provided by the U.S. Geological Survey. The analysis looked at the effect of impervious surface — such as pavement or roofs — on stream “flashiness,” the speed and height of peak stream flows during rains. The AJC estimated impervious surface from Atlanta Regional Commission land use maps using a model that set an average impervious surface percent for different land uses. To measure stream flashiness, the AJC used the Richards-Baker flashiness index, computed by dividing the sum of differences between daily median stream flow by the sum of daily averages for each year, 1999 through 2009. The analysis used daily stream flow data from 19 Geological Survey stream gauges in the metro area. The analysis found that differences in impervious surface explain more than 70 percent of differences in stream flashiness. The AJC interviewed residents and city and county officials and examined City Council minutes, ARC minutes, railroad documents, court records and state and federal regulatory files. The AJC filed an open records request with the state Environmental Protection Division for data about the Norfolk Southern rail yard and Sweetwater Creek during September’s flood. and many state and local emergency managers across the country. // <! [CDATA[// POSTED April 23, 2009 11 p.m. The U.S. Army Corps of Engineers will release additional water down the Chattahoochee River, as a rainy winter has raised Lake Lanier to its highest level since August 2007. Lanier was at a level of 1,063.59 feet above sea level as of 7:15 p.m., according to the U.S. Geological Survey’s Web site. That puts Lanier about 7.5 feet below full pool of 1,071 feet. The frequent rains the area has received during the past two months have raised Lanier nearly 7 feet since Feb. 22 and more than 10 feet since Jan. 1. In early December, Lanier came perilously close to breaking its all-time record low of 1,050.79 feet above sea level. Gainesville has received above-normal rainfall so far this year, according to AccuWeather Inc. Though normal annual rainfall through April 22 is 20.36 inches, Gainesville got 21.23 inches in that time period. April has been wetter than normal, too, with 4.85 inches recorded through Wednesday. The normal monthly rainfall through April 22 is 3.17 inches. Last month, Georgia’s Environmental Protection Division eased water restrictions as drought conditions lessened. The EPD instituted an outdoor watering ban in fall 2007. Lanier’s level at that time was about what it is now and drought conditions gripped much of the state. Since December, the severity of the drought in the Lake Lanier basin has improved from “exceptional,” the worst category, to “moderate.” The lowest category of drought is “abnormally dry,” and state Climatologist David Stooksbury said at the end of March that several more weeks of rain could improve the Lanier basin to that level. The Lanier basin remained in the “moderate” drought range as of Tuesday, according to the U.S. Drought Monitor. The National Weather Service’s three-month drought forecast predicts further easing of drought conditions in Northeast Georgia through July. Though rainfall has resulted in an easing of the outdoor watering ban, restrictions remain in place. According to the corps’ boat ramp elevation calculator, 1,068 is the point at which all existing boat ramps on Lanier are usable; most are accessible at 1,065. The lake supplies much of the Atlanta area’s drinking water. Florida and Alabama opposed the corps’ decision last year to reduce releases from November through April 30. EPD Director Carol Couch, who previously requested the reduced releases, did not make such a request this time. She said sending less water down the river in May as the weather gets warmer could harm the trout population. In the last week of May, Johns Creek rescue units were dispatched three times to stranded waders and frolickers in Chattahoochee River. Swift response and good luck averted a tragedy, but people who play in the river need to be alert and take precautions, especially now that releases from Lake Lanier are less predictable. This year, there have been six to 10 rescue calls on the river from Buford Dam to Morgan Falls. Two were fatalities. With Lake Lanier at full pool and rain falling regularly again, the U.S. Corps of Engineers is releasing water on an as-needed basis rather than on a set schedule as before. That can catch people unawares. “A lot of people go to the river a couple of times when we’re not releasing and they think it’s a serene river, but when we release, it can go from serene to whitewater in a few minutes,” said Park Ranger Pamela Shelton. The Corps does try to give some notice before releasing water downstream from the lake. People can find out about releases by calling 770-945-1466 or by listening to 1610 AM on their radio. The announcements may precede releases by a few hours or even minutes. Four warning sirens have been placed between Buford Dam and State Road 20. The water release will occur within minutes after the sirens stop. During a release, the water level in the Chattahoochee River can surge 11 feet higher in a matter of minutes. Not only that, the current will boom as well. For the unwary, a playful situation can turn dangerous very quickly. And, he said, they were cold. The water is 47 degrees out of the lake. Under the tutelage of Rock and Firefighter Clinton Crites, the City Fire Department is training 20 of its firefighters in swift water rescue. They are training firefighters from Sandy Springs and Roswell as well. Call ahead of time to see when the Corps of Engineers plans to release water, or better yet, call just before entering the river – Be aware of the time and head for the shore when the release is scheduled. Even though it may take a while for the water to get to you, don’t wait. When you’re in the water, wear a floatation device – at least then you probably won’t drown, although you could be seriously banged up from hitting rocks, trees and other obstacles as you’re carried downstream. Keep an eye on the water level – note the water level on a solid fixture, such as a bridge support. Later, if the water level is higher on the fixture, don’t assume it’s a fluke. The water is rising and it’s time to get out! Just because you’re in a boat, don’t assume you’re safe. At least one drowning occurred when a boat struck rocks broadside and flipped. Make sure someone knows where you are. Then, if you’re stranded or clinging to a rock with rushing water tugging at you, someone can find you and alert authorities. For more information, see the US Army Corps of Engineers safety tips for Lake Lanier. Or download and print the attached Chattahoochee Water Safety flyer to share at your next river outing. This is the page I was using for the Chattahoochee River in Georgia / Metro Atlanta – however, there are more rivers and US Rivers information listed by links on the sidebar. And a search function for 401 lakes in the US. The U.S. Army Corps of Engineers is preparing to tighten the spigot at the Atlanta region’s main source of drinking water based on a federal judge’s stinging ruling in the tri-state water dispute. Corps officials say they will rewrite their operating manuals for the Apalachicola-Chattahoochee-Flint River Basin to prohibit certain water withdrawals and releases from Lake Lanier after July 2012. Only Buford and Gainesville would be allowed to continue pulling drinking water from the lake under the Corps’ plans. However, if Georgia, Alabama and Florida reach a compromise and Congress approves withdrawals from the lake, the Corps said it would update its manuals accordingly. The public will have 45 days to comment on the Corps’ plans starting Thursday. U.S. District Judge Paul Magnuson ruled in July that Congress never authorized Lake Lanier to be used for the Atlanta region’s drinking water when the lake was created with federal funds in the 1950s. Atlanta has been illegally tapping the lake for decades, taking water from the Chattahoochee River that should have flowed to Alabama and Florida, the judge ruled. Magnuson ordered that Atlanta’s allocation of water from the lake revert to 1970s levels if Congress doesn’t approve a solution within three years. “We will operate according to what the judge has ruled if nothing changes between now and” July 2012, said E. Patrick Robbins, a spokesman for the Corps Mobile District. A spokesman for Gov. Sonny Perdue called the Corps’ decision disappointing. He said Perdue is preparing to meet soon with his counterparts in Florida and Alabama to work out a compromise. Meanwhile, Georgia is appealing Judge Magnuson’s ruling. Sen. Richard Shelby (R-Ala.) issued a statement about the Corps decision Wednesday. At the end of the plant’s tailpipe is wet limestone scrubbers that reduce sulfur dioxide from burning coal by 95 percent.Sulfur dioxide contributes to acid rain, and overall, TVA has reduces emissions by 91 percent since 1977, and harmful nitrogen oxides have been cut by 89 percent since 1995. In 2004, Cumberland Fossil Plant was upgraded with a selective catalytic reduction system to lower nitrogen oxides by about 90 percent, reducing the compound to nitrogen and water. And the clean-up has not been cheap. TVA has spent $5.3 billion to control emissions from its 11 coal-fired plants, which in 2009 produced 46 percent of the system’s electricity. Nuclear power produced 32 percent of the electricity, 13 percent was purchased from other utilities and 7 percent was generated by water. Another 2 percent was derived from natural gas, diesel fuel and renewable sources like solar and wind power. The Cumberland plant has two units that produce electricity, each independent of the other. Low-sulfur coal from southeastern Illinois and northern Kentucky is off-loaded from barges on the Cumberland River and covered conveyor belts transfer it to giant hoppers that hold enough coal to supply the furnace for 16 hours. Some coal is stored on the 1,425-acre site; a 40-day reserve. The coal is pulverized into a fine powder and blown into the furnace, where it creates an eight-story fireball with temperatures between 1,000 and 2,500 degrees. The heat converts treated water into steam inside a boiler that lines the inside of the upper portion of the furnace. Mullinax said the furnace is actually suspended from the top of the 13-story structure so it can expand downward from the heat it produces. The steam is under great pressure and is used to spin a huge turbine at 3,600 RPMs, which turns a generator that produces electricity. Meanwhile, the steam is directed over cooling condensers filled with river water, and the vapor is converted back to liquid, which is recycled back through the boiler system. The cooling water is returned to the river at a slightly higher temperature. Smoke from the burning process is diverted to the scrubbers, which sprays a pulverized limestone and water slurry to remove the sulfur dioxide. The emissions are released via twin 600-feet-tall smoke stacks. The two taller stacks are no longer used. A by-product of the process is high-quality gypsum that is stored on a 100-acre site. Most is sold to Temple Inland, one of the largest wall board manufacturers in the nation, which is located adjacent to the site. Also, fly ash that remains from burning the coal is sold as a byproduct. It’s used in asphalt shingles and road construction. Combined, TVA sold more than 750,000 tons of the byproducts in 2009, Scott said. Mullinax said the fly ash is stored dry in large silos onsite. The method is different than wet storage at the coal-fired plant in Kingston, which last year had a failure of its retention dykes, causing the mud-like waste to flood homes and businesses near the plant. The Cumberland plant’s ability to dependably produce plenty of electricity at a relatively low cost with substantially less pollutants released into atmosphere is good business for industry. A prime example is Hemlock Semiconductor LLC, which is building a $1.2 billion plant in Clarksville to produce components for solar energy production. It will be a direct TVA customer and Hemlock officials have said a major reason for selecting a site here was availability of enough electricity to power its operations. MMS has suggested guidelines that you may follow if your white paper results in a future request for a full proposal. The purpose is to provide consistency in proposals to expedite the review process. The MMS has completed an assessment of the undiscovered technically recoverable resources (UTRR) underlying offshore waters on the Outer Continental Shelf (OCS). This assessment was based on information available as of January 1, 2003, including information obtained from new exploration activities in the Gulf of Mexico and in the Scotian Basin Offshore Canada. The MMS estimates that the quantity of undiscovered technically recoverable resources ranges from 66.6 to 115.3 billion barrels of oil and 326.4 to 565.9 trillion cubic feet of natural gas. The mean or average estimate is 85.9 billion barrels of oil and 419.9 trillion cubic feet of natural gas. These volumes of UTRR for the OCS represent about 60 percent of the total oil and 40 percent of the total natural gas estimated to be contained in undiscovered fields in the United States. The mean estimates for both oil and gas increased about 15 percent compared to the 2001 assessment. For the oil resources, the vast majority of this increase occurred in the deepwater areas of the Gulf of Mexico, while for gas resources the majority of the increase was in deep gas plays located beneath the shallow water shelf of the Gulf of Mexico. MMS periodically conducts comprehensive assessments of the undiscovered oil and gas resources on the OCS. 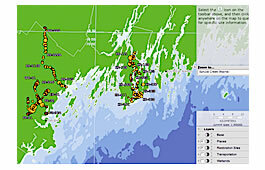 The last comprehensive inventory was completed in 2001, with an interim update in 2003 to reflect significant changes in natural gas potential in the Gulf of Mexico. The resource assessments also include production and reserve estimates for the OCS as well as estimates of undiscovered economically recoverable resources. Undiscovered economically recoverable resources (UERR), presented in the form of price-supply curves, represent the portion of the undiscovered technically recoverable hydrocarbons that can be explored, developed and commercially produced at given costs and price considerations. 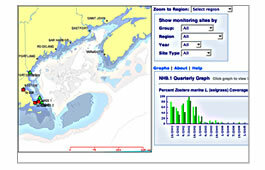 The results of this assessment, published as a brochure entitled Assessment of Undiscovered Technically Recoverable Oil and Gas Resources of the Nation’s Outer Continental Shelf, 2006 is available in electronic form below or in printed form free of charge, as long as supplies last, from the MMS Resource Evaluation Division, 381 Elden Street, Mail Stop 4070, Herndon, VA 20170. 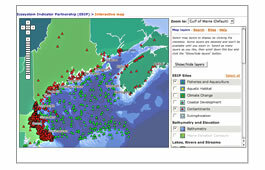 Interactive map showing the locations of monitoring programs for aquatic habitat, climate change, coastal development, contaminants, eutrophication, and fisheries and aquaculture. 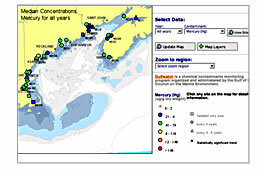 Web-based system that enables sharing, integration, and use of coastal habitat monitoring data. As a proof of concept, the system has been developed initially with data from a limited number of monitoring sites in salt marshes and seagrass beds. 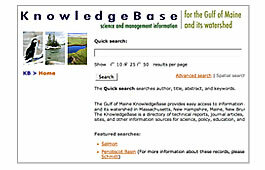 Bibliographic database of scientific papers, technical reports, workshop proceedings, fact sheets, and other information related to ocean and coastal management in the Gulf of Maine and its watershed. 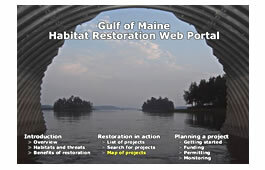 Resources for planning and implementing habitat restoration projects in the Gulf of Maine and its watershed. Mapping tools. Restoration project summaries. Habitat restoration grants RFP is released. The period for submitting online full proposals is March 1st – April 2nd 2010. 484 potential sites for habitat restoration in 4 Gulf of Maine watersheds: Kennebec River, Royal River, Presumpscot River, and Spruce Creek. Interactive map and search tool. Sites categorized by town, waterbody, habitat, source of degradation, area of habitat affected, type of restoration needed, and cost rank. Measuring contaminants in blue mussels to assess the types and concentration of contaminants in coastal waters of the Gulf of Maine. Interactive map. Downloadable data. Introductory information, maps, and photographs. 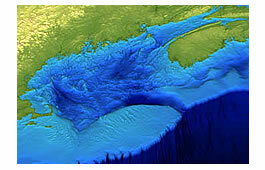 The Gulf of Maine is bordered by Massachusetts, New Hampshire, Maine, New Brunswick, and Nova Scotia. It covers 93,000 square kilometers (36,000 square miles) of ocean and has 12,000 kilometers (7,500 miles) of coastline. I wonder if there is such a thing for the Gulf of Mexico where the oil spill is doing its damage? h research and synthesis of information.